“Pretty, ugly, gross, bloody, pissed, catchy, heavy.” These are the words spewed from KISSING CANDICE frontman Joey Simpson when describing the bands impending album, Blind Until We Burn, coming June 30th on Victory Records. Blind Until We Burn is one of the most blood-drenched doses of violence that has been put to ears. Distinct themes of angry defiance and horror-laced hysteria snake throughout the album, which Simpson bodes, “Sometimes you never see things for what they are until it's too late." Whether it’s distressing paranoia or a bloody discharged axe-wound, KISSING CANDICE bring a new vision of the macabre, pulling the listener to shake a layer of dust off a tired genre which too often trades intelligence for fantasy, substance for spectacle. 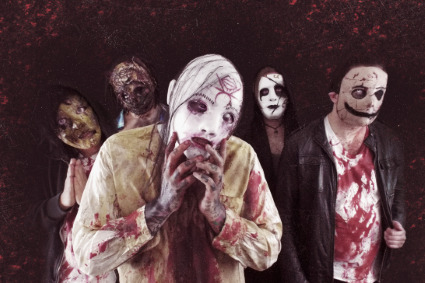 KISSING CANDICEwill be serving up their malevolent new offerings on the “Back To Hell - The Darkness Tour” with Twiztid and Kung Fu Vampire this May. In June, the band will be part of the Rockstar Energy Drink Mayhem Festival, featuring one of the original theatrical lords of the stage, King Diamond. Blind Until We Burnis so relentless, so sinister, that long after the final track fades, it continues to drill forward in the mind. Get blinded on June 30th, 2015.